Denver’s independent restaurant and microbrewery scenes are thriving, and I firmly believe both are thriving because of their collaboration, not in spite of it. Lately, another group of local entrepreneurs has been collaborating to create a food/beverage whole that is greater than the sum of its parts: the owners of Denver’s food trucks. To say that Denver’s food truck scene is thriving is probably an understatement. More accurate would be the word “exploding,” and collaboration has been a key driver of the food trucks’ success. Pull up to Renegade Brewing Co. on any given evening, for example, and you will find a food truck parked right outside. The food truck benefits Renegade, as it gives patrons a food option at a tasting room that otherwise only serves beer (pretty strong and delicious beer, at that! ), and it benefits the food truck, as it gives the food truck access to a large group of hungry (and/or tipsy) patrons who are craving food. These types of food truck-microbrewery synergies are taking place all over our city. More importantly, though, food trucks haven’t only collaborated with microbreweries, they’ve collaborated with each other. 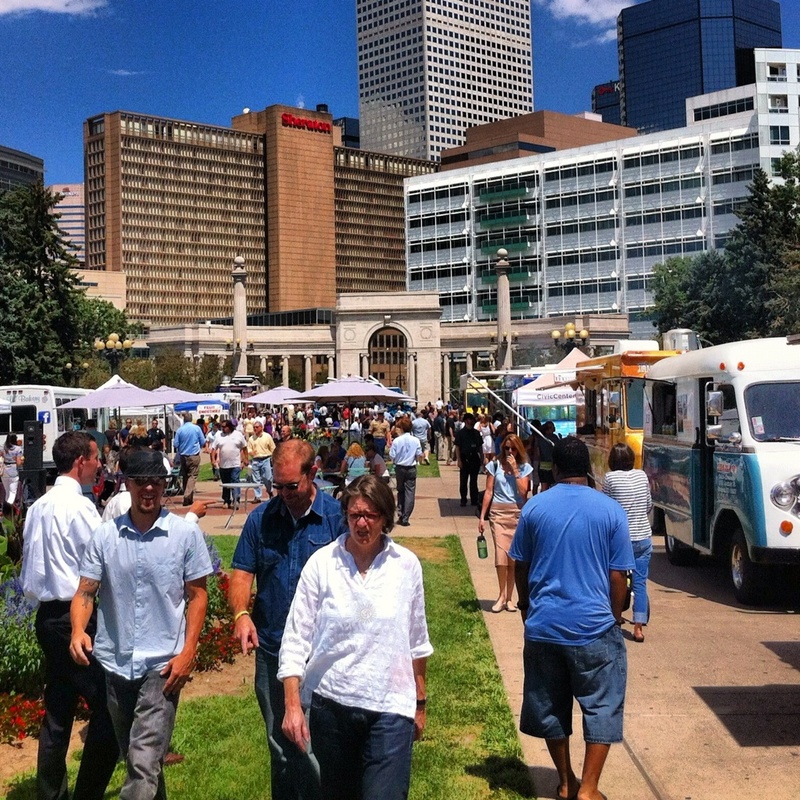 Civic Center EATS, which takes place between 11am and 2pm every Tuesday and Thursday (through late September) in Civic Center Park, is a collaboration at which dozens of food trucks all come together to the same location for everyone’s eating pleasure. Sponsored by Civic Center Conservancy, the event has grown immensely popular, with more and more food trucks participating and more and more hungry patrons partaking. By bringing dozens of food options together in a very small radius, the event is a benefit to hungry and busy workers on their lunch breaks, and it also benefits the food trucks as it provides an ever-growing, consistent, and repeat customer base. Did I mention the food from these trucks is very Good? I love the gyro pita from Mythos Greek Food Truck, the arepas from Quiero Arepas, the Colorado buffalo sausage from The Uber Sausage, and the pulled pork sandwich from NZ’s Smokin’ Guns. Delicious. There are so many more Good options ranging from tacos, pizza, food on a stick, fresh-squeezed lemonade, home-made popsicles, vegan food, and more. Don’t have cash with you? Most of the food trucks take credit cards via Square. Civic Center EATS takes place in Civic Center Park. For more information on Denver’s food truck scene, check out DenverStreetFood.com. For more information on Civic Center Eats, click here. Denver’s thriving dining scene is just one of the many reasons why Denver is a fantastic place to live. Click here to search homes for sale in Denver. In addition to writing for The Good Life Denver, David works full-time as a Denver real estate agent. Contact him today for all of your Denver real estate needs.